Today I was playing with some Basic Grey Paper from the travel book, the leftover from my birthday card I just made :) I layered it onto some hunter green card stock that was my base. 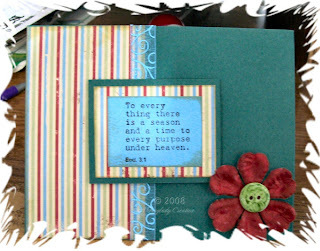 Then used a smaller matted piece in the center for my sentiment from TAC Be Still T-2890 set. I stamped it with Versafine Onyx Black onto the blue card stock scrap I had and then used some blue ribbon from Really Reasonable Ribbon to tie it together. I thought the corner looked a little bare so I added a Prima that I colored with my Copic R29 marker to match the stripes in the paper. Then for the middle I dabbed my YG63 Copic onto a cream colored button to make the center. I used a bit of Haystack Palette ink to edge the papers before adhering them all together. Thanks for stopping by today!